When I posted a pretty picture of fresh beets on my Fountain Avenue Kitchen Facebook page, I was amazed by the reaction. (Click on this link to read all the wonderful comments.) I always think of beets as a love-them-or-hate-them food. You’re either all in or all out! Well, readers that day were in deep. They loved beet and had all sorts of favorite ways to enjoy them: Harvard beets, beet hummus, borscht, beets chips, pickles, salads…and on and on. One reader, Sheila, mentioned that she makes a beet cake that “is so moist and good the kids don’t know it’s beets!” Sheila went on to say that she baked this recipe for many years while working in an Italian restaurant. The recipe originated with the elderly Italian owner, and Sheila has continued to bake it for her family since retiring from the restaurant. Sheila thoughtfully shared her recipe and I had to make it…right away. The look on my kids’ faces when I told them the namesake ingredient was priceless. I think they shocked themselves when they enjoyed it as much as they did! The flavor and texture are somehow reminiscent of an apple cake my grandmother used to make, but with much different ingredients! Thank you, Sheila, for sharing this unique and absolutely delicious recipe! 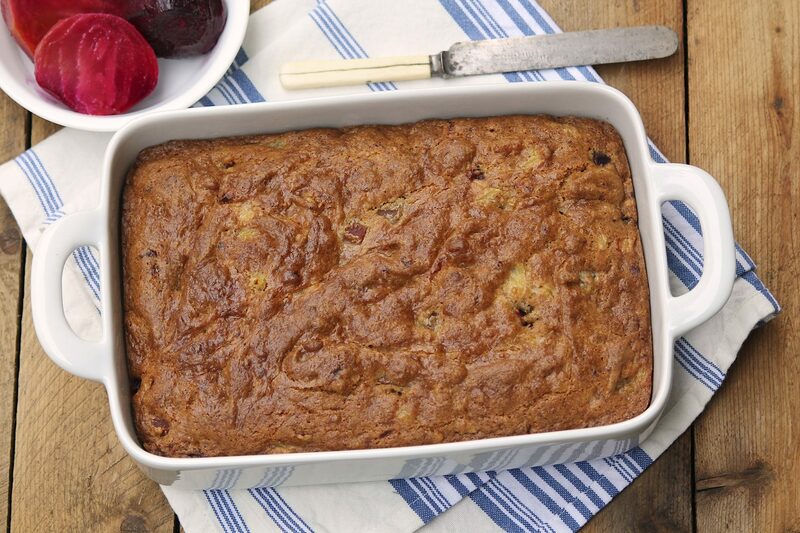 This recipe may easily be doubled and baked in a 9×13-inch baking dish. Extend the cooking time a few extra minutes if doing so. Sheila likes to dust the cooled cake with a bit of confectioner’s sugar. We enjoyed it as is. In a large bowl, mix together the dry ingredients. In a separate bowl, mix together the wet ingredients. Make a pool in the center of the dry ingredients and add the wet ingredients, stirring to combine. Bake for 35 minutes or until the center of the cake is just cooked through. As all ovens vary, check a few minutes early so as not to dry out. Conversely, allow a few extra minutes if needed. 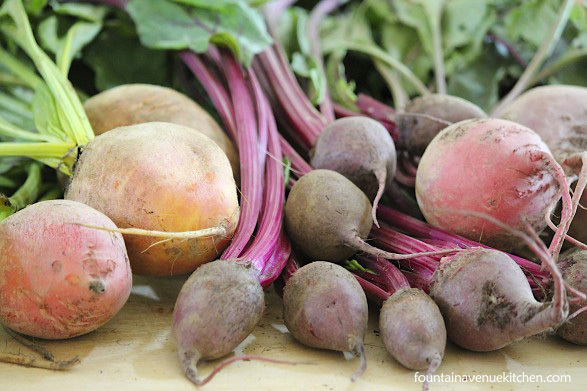 For two foolproof and virtually mess-free ways to roast beets, click here. And if you are roasting beets, you might want to save some for Beet Salad with Walnut and Goat Cheese. This sounds wonderful…beets are so good for you. How can I make this gluten-free? I actually made a gluten-free version using this blend: https://fountainavenuekitchen.com/all-purpose-gluten-free-flour-blend. You could try with a store-bought gluten-free flour blend, but I can definitely vouch for this mix. I use it often and the results are consistently great! If I wanted to make this dairy-free, do you think it would ruin the cake if I substituted the cottage cheese with just a non-dairy milk? Great question, Jamie. I think it should work. If I were to do this, I might try canned coconut milk since it is thick and creamy. You could start with a scant half cup since the cottage cheese is less liquidy. If you try, I’d love to know how you make out! I made this cake, gave my husband a piece & told him to tell me what he thought was in it. He loved it & it just made a nice snack for us for a few nights. Will surely make this again! I am so glad you made this and enjoyed, Joan. Thanks for the great feedback!